Eugene Simon auf der MAGICCON. 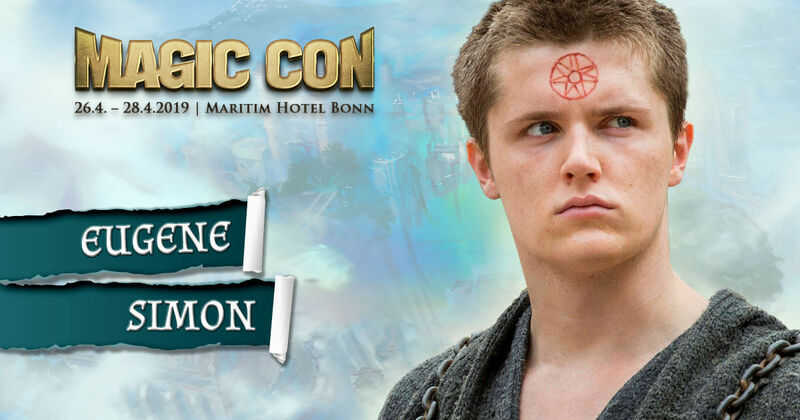 With the British actor Eugene Simon, a representative from HBO’s successful series Game of Thrones is on his way to Bonn to tell us about some exciting events around his role as Lancel Lannister at MagicCon 2019. Parallel to his Game of Thrones appearances (over six seasons) Simon also shot for the Nickelodeon production House of Anubis, where he played a leading role with the character Jerome Clarke over 191 episodes. This marked his breakthrough in the USA in 2011. On the big screen Eugene Simon slipped into the skin of the young heartbreaker for the production Casanova (2005) with Heath Ledger in the leading role. And also in the new film adaptation of Ben Hur (2010) the multi-talented Brit embodied the eponymous hero of the same name in his younger years. This year he will again be featured in Kill Ben Lyk (currently in post-production), this time in the lead role. There is no doubt that Eugene will cut a good figure on the stage of MagicCon due to his modeling activities. But we can certainly look forward to exciting details about his career as an actor. So save your ticket in the Ticket-Shop now!